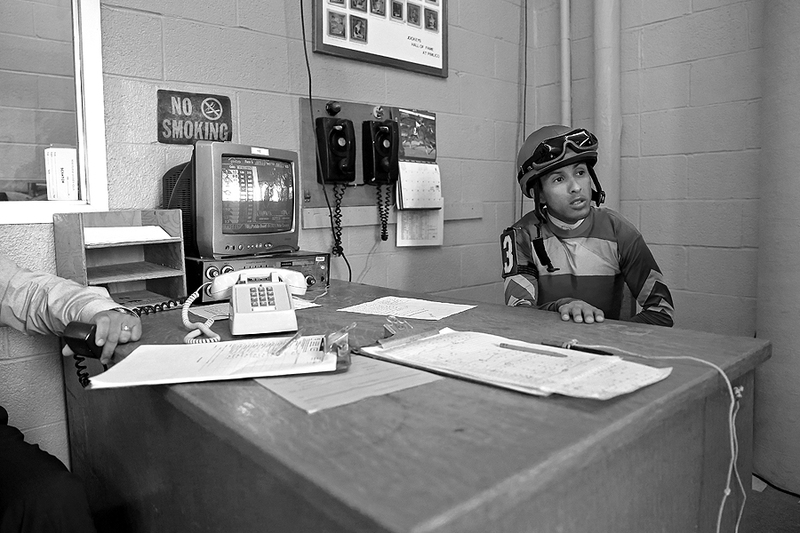 "Victor R. Carrasco #3 jockey of Picko's Pride sits at a desk following being weighed in prior to The Maryland Sprint Handicap at Pimlico Race Course on May 16, 2015 in Baltimore, Maryland." Each and every year I'm typically in Baltimore covering the Preakness Stakes. If I can think back correctly, this was probably my ninth or tenth I've covered, and my fifth in a row with Getty Images. I've grown to really love horse racing. My grandfather was major supporter and fan and I think that keeps my interests peaked when on the rail. The challenge thought is that the Preakness occurs at the same venue where the same events happen each year. It's an early morning with lots of preparation before the main event per say. It's no different than driving to the same office building each day for work. You see the same things in passing and as hard as you search for something new to look at, you don't always see it. So there are many factors that make Preakness different each year, yet finding a new, fresh image from the event can be a major challenge. Especially when one of my favorite images was shot behind the scenes there a couple years ago. Nonetheless, we had an amazing team as always and tackled the event from every angle. While not nearly as telling as the main race, or a picture of the horse who will possibly become a triple crown winner, it was this moment behind the scenes, and behind the desk, that I thought was a new scene. The image doesn't smack you in the face, but it makes you ask questions and look around the frame. To my eye, these types of images are often the most complex and visual at the end of the day even if they don't directly relate to the big picture.